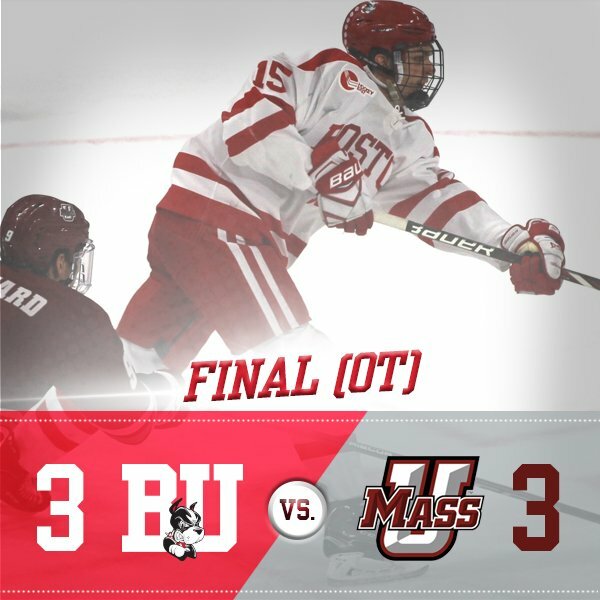 After building a 3-1 lead after two periods, BU yielded a pair of third period goals to UMass and had to settle for a 3-3 tie, gaining just one point in the Hockey East standings. Freshman Shane Bowers continued to wield a hot stick, scoring twice for seven goals in the last nine games. Bobo Carpenter tallied his team-leading 17th goal. UMass got on the board first when John Leonard ripped a shot from the high slot past Jake Oettinger’s glove on an odd-man rush. The Terriers countered quickly on the rush with freshman Logan Cockerill taking the initial shot and Bowers outworking the UMass defense to bury the rebound. Hank Crone also assisted. In the final seconds of the first period, Crone collected a puck in the BU zone and headmaned it to Carpenter who sped past a UMass defender and wired a shot under the crossbar to Matt Murray’s glove side. Early in the second period BU extended the lead on a power play. Freshman Brady Tkachuk teed up the puck for Dante Fabbro’s one-timer, which Murray saved, but Bowers, camped out next to the crease, tapped home the rebound to make it 3-1. The Terriers thoroughly dominated the period, outshooting UMass 12-4, but failed to extend the lead. UMass cut the lead in half early in the third when Austin Albrecht’s shot from the right point was redirected home by Jack Suter. Ten minutes later, Niko Rufo took a drop pass and fired from the left circle. Oettinger made the save but the rebound went directly to an unmarked Mitchell Chaffee who had an empty half net and tied the score. BU outshot UMass, 41-23, but lost the faceoff battle by a 21-33 margin. With 15 goals, Bowers leads all Hockey East freshman and is tied for the national lead. The tie stretched BU’s unbeaten streak to nine games (7-0-2) and the Terriers have scored at least one power play goal in the last seven games.